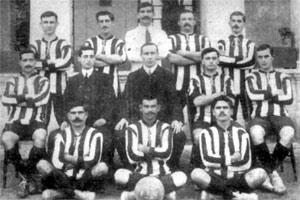 The Floriana team of the 1908-10 period. Guzeppi Vella is seen in the photo standing second from left. His brother, Manwel, is squatting on the left in the front row. In January 1910, Floriana FC invited the Army Cup leaders, the King's Royal Rifles (KRR), for a challenge cup match. The KRR had a formidable team and were certainly worthy opponents of Floriana. The Regiment accepted the challenge and the match was played on January 25, 1910 in Pembroke. Both sides played their hearts out but, in the end, the match finished in a goalless draw. The Greens had fielded their best formation - Pawlu Borg, Ruggieru Friggieri, Fredu Friggieri, Salvu Tabone, Guzi Mallia, Manwel Vella, Gakkinu Falzon, F. Palmier, Jack Holland, Salvu Samuel and Robert Naudi. With this same formation, Floriana won the first Maltese football league a few months later. Missing from the team, however, was one of the best Maltese players of the era, Guzeppi Vella, or Spagu, as he was affectionately known. Vella, together with his brother, Manwel, was an automatic choice in any Floriana team of that era. On the day Floriana were to meet the King's Royal Rifles, Guzeppi was in hospital suffering from bronchitis which he had incurred while playing football. A few days after that match, Vella, still visibly weak from the ordeal of his illness, was included in the Floriana team that played against the Suffolk Regiment at St Andrew's on February 13, 1910. Guzeppi played his heart out in that game. It seemed that he sensed that this was to be his last game of football. He helped Floriana to win 2-0 but shortly after the match he had a relapse of his illness. He was rushed to hospital but died soon afterwards at the tender age of 22. It was a terrible loss for Floriana and Maltese football. Guzeppi left Manwel to carry on with the job of bringing greatness to Floriana. Manwel, Il-Bazokk, was born in Floriana in 1886. Together with Guzeppi he spent his free time kicking everything in sight around the ditches of Floriana. He kept good company and among his friends were Ruggieru Friggieri and Salvu Tabone, two other great Floriana stars of the future. At the age of 18 he joined the famous amateur club Colonials FC. His classic wing-half play soon caught the eye of his seniors and when Floriana were preparing their team for the Imtarfa Cup match against St George's in 1908, he was picked to play at right-half alongside his schoolboys friends, Friggieri and Tabone. This was the start of the greatest era in the long history of Floriana. Between 1909 and 1913, they won three championships and two cup competitions. Vella was ever-present in the team during that glorious period. When Floriana broke up in 1914, Vella joined Hamrun Spartans for one year and then went on for another season with St George's. The records for the next few years are very sketchy and, unfortunately, we lost track of this great player but he probably continued playing for St George's or for Valletta United. During the First World War he joined the KOMRM, forming part of the team which kept the Maltese flag flying high in the United Service League against the mighty British teams of the era. After the war, he rejoined Floriana, winning yet another championship but in 1921 he joined the Police Force and he was impeded from playing football. In 1921-22, the Police formed their own team and Manwel, although now well in his 30s, dusted his boots and played for one more year before finally giving up the game forever. Quiet and unassuming, he gave honest service to every team he played for. His great contribution to the game, however, was not always recognised, especially by the MFA selectors. They never picked him to play for the National XI. He died in 1939 at the age of 53.